Davis Tower was at the top of Coburn Ave in Lake Park. The Davis Tower at Lake Park marks the site of the home of Samuel Leonardson. However, the first home site in Worcester was actually that of Ephraim Curtis on Lincoln Street. The following are links about Davis Tower you may find interesting. Also check out the other pages. The following are comments left about Davis Tower from site visitors such as yourself. They are not spell checked or reviewed for accuracy. The Davis Tower at Lake Park marks the site of the home of Samuel Leonardson. However, the first homesite in Worcester was actually that of Ephraim Curtis on Lincoln Street. 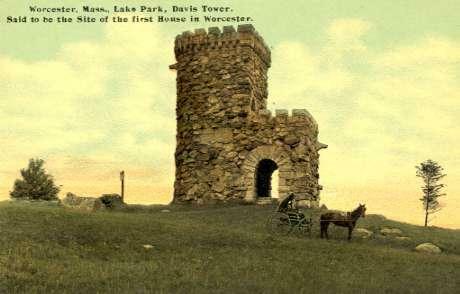 From "Old Landmarks and Historical Spots of Worcester Massachusetts", Sparks, 1931, the author talks about this tower as the "Lake Tower" and he says it was the home site of Samuel Lenorson. 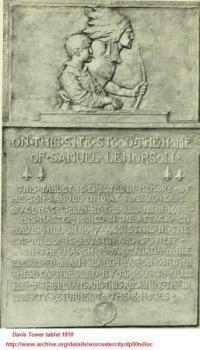 On the front of the tower is a tablet which reads " On this site stood the home of Samuel Lenorson. 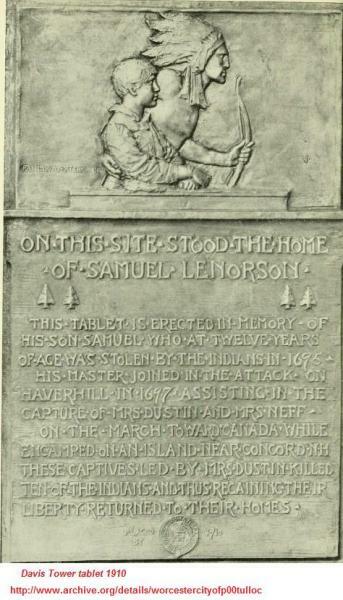 This tablet is erected in memory of his son Samuel who at twelve years of age was stolen by the indians in 1695. His master joined in the attack on Haverhill in 1697 assisting in the capture of Mrs. Dustin and Mrs Neff. On the march towards Canada while Encamped on an island near Concord, N.H. these captives lead by Mrs Dustin killed Ten of the Indians and thus regaining their liberty returned to their homes". The author goes on to mention that "At the corner of Hamilton and Cobern, near the Tower, is a separate memorial to the Lenorson boy. It is two tablets commemoration the capture and return of the boy. It is lying on the ground, unprotected by the weather and from the attacks by vandals." It was the intent to have this memorial at the old homesite but it was of such poor quality that it never was accepted. I lived and grew up directly across from "the Tower" at 362 Coburn Ave., Worcester, from the year I was born in 1954 until the early-1970s, when I went away to college, eventually leaving Worcester in the late 1970s after college. My mother still lives at 362 Coburn Ave. The Tower had heavy iron gates built into the stone work on both sides of the ground level archway opening, with a large swinging iron gate door built into the gate on the North side which overlooked Lake Park. The swinging gate was usually unlocked in the mornings of fair weather months by the Lake Park manager/groundskeeper and sometimes locked at night (this schedule was irregular and you could never count on when it would be unlocked or locked) The times when the Tower was locked up increased during the 1960's until it was locked up forever in the late 1960's/early 1970's when the City had allowed the Tower to run down with absolutely no maintenance for the stone mortar and leaves/trash that built up from being exposed to the weather and the people who climbed the winding, spiral stairs that climbed to the top of the open roof of the Tower. The winding stone stairwell that wound its way up to the open air first landing and then continued on up to the open air roof of the Tower was really cool, with high ceilings above the stairs with tall, narrow windows cut through the walls of the Tower--essentially what you envision the inside of a Medieval stone castle looks like--a total blast for us kids who lived in the neighborhood who regularly went up the Tower to the roof. From the top, you could see Lake Quinsigamond and across to Shrewsbury to the North with several lake islands in view and even see motorboats and waterskiers in the view point slivers between the trees that lined the Lake. Because of the plaques and inscriptions around and on the Tower and local folklore legends passed on by word of mouth, we kids knew about the Indian attack on the original homesite where the Tower stood and that a boy had been "kidnapped" back in 1695--which was totally cool for us kids to think that real Indians had actually attacked the house of Worcester's first settlers right across the street from us! 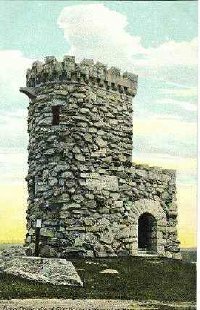 Most of us kids didn't know that there was another stone "Tower" elsewhere in Worcester until we were teenagers and found out about Bancroft Tower--we thought our "Tower" was the coolest and unique. Before the early 1970's, the City actually cleaned and maintained the stone mortar work and inside of the Tower and officially invited and allowed tourists and passersby to go up to the top for the fantastic panarama the top of the Tower afforded looking North over Lake Park and Lake Quinsig. Also, when the big iron gate was locked (either regularly through the 1950's-1960's and then, later, when it was permanently locked sometime around 1970), we kids simply used to climb over the tall gate (approx. 10-12 feet tall) and drop down the other side and go up the winding, enclosed stairs to the top--our own stone, Medieval castle and enjoy the view--and we thought we were cool for climbing over the tall iron gate--one of the first, important "rites of passage" for kids in the neighborhood! Sometimes, we would even tempt fate and stand or sit with our legs hanging out over the edge of the Tower between the big, stone blocks which served as the parapets on top! Occasionally, to this day, something will remind me out of the blue of being on top of the Tower (along with a cold, electric shudder that pulses inside my brain) when some of us neighborhood kids would walk around on top of the large parapet stones on top of the Tower--standing approximately 50 feet above the ground! Those large stones on top of the Tower (which you can see in your postcard picture) were roughly cut at the quarry they came from and were pretty uneven on top--not a real good surface to be walking around on with the 50 foot drop off only a slip away! Yeah, we lived totally "on the edge" back in those days...however, I never personally knew that anyone had actually fallen off the top of the Tower, but there were persistent myths/urban rumors that someone had fallen off the top of the Tower-either to their death or were seriously injured--don't know if anyone actually did fall from the Tower though--maybe you can return the favor of this thumbnail history and research this issue in the City of Worcester's records on the "Davis-Lake Park Tower" and let me know. 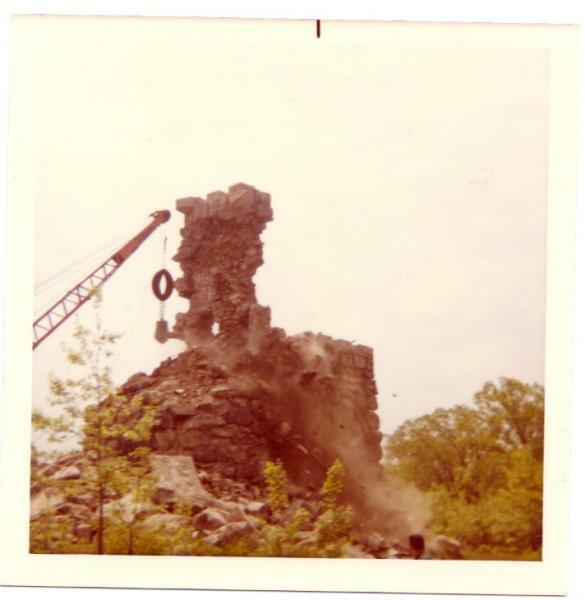 Oh, by the way, the Tower was knocked down and completely removed (other than its rough stone foundation slab) by the City of Worcester sometime in the mid-1970's because it had supposedly become a health risk/liability due to the City's decision to stop maintaining it or preserve by the early 1970's. It was truly a sad day to see the Tower go...no one likes to see one of his childhood's prime landmarks and the site of weekly childhood neighborhood events and assorted rites of bravery and adventure torn down--especially when the Tower commemorated the first settlor's homesite within the City of Worcester as well as the very real, historic Indian attack in 1695 which resulted in the son of the City's first settlor being kidnapped by Indians (the Leonardson boy) and likely contributed to Mr. Leonardson later participating in the raid in Haverhill in 1697 which assisted in the rescue of the two women who also had been kidnapped by Indians. Such real and truly exciting pre-Revolutionary frontier history concerning our little hamlet of Worcester seems very much worth preserving...now, doesn't it? Too bad it wasn't preserved for future generations. Oh well, now we have pictures from old postcards like yours to remind us of all that very real, exciting pre-Revolutionary Indian and first settlor history--what a trade off, huh? Best of luck with your history project...let me know what you find out from the City's records/archives concerning the "Lake/Davis Tower." Thank you so much. I remember this what I was a kid, what year did the city tear it down (68?). Any ideas why? The Davis Tower was demolished in mid 1969. Growing up in the Hamilton St area, I was especially intrigued by the Davis Tower and the historical background of the site. As a 13 year old with an avid interest in Worcester's history,in the spring of 1969, I made several visits to the top of the tower. At the time, I did not realize that the 80 year old structure was about to be destroyed. During June 23-July 2, 1969, my family visited Florida (incidently, the highlight of the trip was going to Cape Kennedy to see Apollo 11 on the launch pad 3 weeks before the flight)...very shortly after returning from Florida, I found out that the Davis Tower had been razed, only a few large stones remained. OK am I losing my mind? I live at 208 Coburn Avenue in Worcester. Where the heck is this tower?? I am from phila pa but I lived in worcester 1952 t0 1957. I was just 17 when I 1st arrived. I will always love the place.I also worked at wor.state hosp for 3 years.I met my wife there,she was a student nurse(st. vincents)I will always cherish the years I spent in wor. Ok so that is the Davis tower. what tower was near the baseball field?? Parts of it are still there. I have fond memories of that tower...we use to call it the Indian tower.Friends and i would bring a bagged lunch and climb over gate and go to the top and eat our lunch. I live in Florida now and last time i was up in worcester to visit...i was very sad to see it had been taken down...the stone was so huge i thought it would stand there forever! I, too, can attest to the excitement of climbing up those steep, deep stairs to the top of the tower. My cousins, who have already left their dreamy comments about Davis Tower, lived across the street. To spend a day at the Flynn's was always a trip. The tower on one side of their property, the railroad tracks just below a ledge on the other side of their homesite. For this project kid, I turnedinto Annie Oakley, playing 'cowboys and indians'. What fun. I'm the third member of the Flynn family, the big sister of the above two brothers. As Jay said, we lived directly across the street from this tower, not fifty feet from our front door. Looking at this picture brings back flashbacks of childhood play, where all the children in the neighborhood used noting but our imaginations, some sticks, straw, home made costumes to play an array of games. My cousin Karen B. remembers cowboys and indians. I remember climbing the tower before I was ten, when the gates were open. Then when the gates were locked, despite being younger, my brothers dexterity won out and they easily climber the gates. My favorite season was winter when we sledded all day long down the 'great big hill' behing the tower. On a recent nostalgic trip by 'our' house the hill was only a mound compared to my memory. Our snow suits and mittens were made out of wool, got very wet, were put over the radiator in the kitchen during lunch, and were then put on wet for the afternoon sledding, we didn't seem to notice. Times have changed. My mother lived in that house for 50 years before moving to an assisted living facility. A lot of family memories are in this little neighborhood. My brothers and I used almost every activity that was offered by the city parks program, tennis, swimming, sailing, baseball, summer "day care" camp before there was an such a title. I loved the outdoors as a child and often hiked alone throughout the 300 acres of Quinsigamund park picking blueberries, or playing in a creek full of tadpoles. Life has changed. We never heard the trains going by day or night, only visitors would be kept awake. I do remember arriving home on a visit in the early 70's and the tower was gone . . . it had been in dire disrepair but it was certainly a shock to see the void. Lake Park. In 1884 Hon. Edward L. Davis and Mr. Horace H. Bigelow deeded to the city about 110 acres of land bordering on Lake Quinsigamond. Mr. Davis also gave $5,000 to improve the park and erected at his own expense a stone tower, built of rough stones gathered from surrounding land. Area, 110 acres. This is so strange. I just started watching a netflix movie with an old castle that jarred my memory back to the days of lake park and regatta point. I remember it being at the top of a hill that turned into Hamilton St. and decided to pause the movie and google lake park castle in Worcester. (I have been living in NJ since 1981) Anyway, I don't remember thinking about playing there in the 60's since then! I remember you Joe Pellegrino, I think? Some of the other names look familiar to me to on this thread. Great memories of riding bikes up that hill and hanging at the castle. I don't know the next time I'll visit WOR but will definitely go to that part of the city and fill in all the gaps. Btw, I grew up on Ingleside Ave, near "French Hill". Does anyone remember Candelas super market? You can find me on facebook, central nj. I recently moved to Coburn Ave and walk my dog through the woods near the baseball field every day. I'd love to find out more history about the park. There seems to be ruins of a sort; was there a house and other buildings near the baseball field? Who owned it and what happened to their families. I really love the area, it has so much to offer and aside from traffic on Lake Ave, it is just about the best place that I've lived! I grew up on Nonquit St. until I was about 11 yrs. old and remember that Tower! Although I never went inside it I spent alot of time playing at the parks - anyone remember the old swingsets next to the baseball field? There was also a round stone building in the area of the baseball field, I wonder what that was? and how about the "sunhouse" as we used to call it, in the middle of that patch of woods between Nonquit and bottom of Hamilton St? How fun it was to grow up a Pedone! Off to my next google - I shall report on my findings! The Round House that Jill M. inquires about was most likely built as a community center. I remember going to a family wedding shower there as a young girl and I remember my mother going there for elections. It was a large open room with kitchen kitchen facilities included. It was old when I was there 50+ years ago. This brings back many wonderful memories? Does anyone remember Mrs. Chicoine who owned the little store at the corner or Eddie Rackus, the Lake Park caretaker? Yes, Donna i remember you as well...long time.Who can forget Candella's Market? Joe, Are you the Joe that worked at memorial hospital and lived on north lake ave?. My grandfather Matteo Dellomo lived on the top of Boston Ave at 34 Glezen. My cousin and best friend in those days was one Arthur "Buster" Merchant, who also lived on Glezen St. He used to take me down there and we would climb to the top, most times by climbing over the iron gate. Then my cousin Jimmy Smith, who also lived on Glezen, would drive down with his girl Ann and we would all go down to the ball field on Lake Ave and Jimmy would smooch it up with his future and still wife Ann while Buster and I climbed the extremely large boulder just west of home plate. Buster died in his early fifties from complications after serving in Vietnam and being the best cousin anybody could ever have. Later on im my life, whenever I played baseball at Lake Park or softball on Coburn Ave, I could not help thinking of the "indian tower" on Colburn Ave. Thanks to everyone who just made my day better as I read the entries. Bet many of you knew both Buster and Jimmy Smith. Count me in as one who spent many hours in Lake Park. My brother and I were raised at 498 Coburn Ave. Managed to get into the tower once when the gate was left open. The park was a favorite diversion, sledding in winter and picking blue berries in the summer so Mom could bake a pie. Used to collect coke bottles down by the tracks to buy gas for the boat at Doc's Marina. I was sad when Mom told me that the city had closed Coburn Ave off, had a few pleasant memories from up there.